This is truly one of the oddest passages in the Scripture. It’s probable that the only reason that it even shows up in our lectionary is because this week’s Gospel passage actually refers to it. Here we find the people of Israel in the wilderness. They have been delivered from their captivity and, once again, as they’ve done before, they are complaining, “murmuring” about how bad they have it. “Why have you brought us up out of Egypt,” they cry to Moses, “to die in the wilderness? For there is no food and no water and we hate this miserable food that we do have.” (So, apparently, it wasn’t that they didn’t HAVE food; they just didn’t have what they wanted!) Now if you remember a similar occasion in the Book of Exodus, God hears the complaints of the people and rains down manna upon them. But this time, God sends poisonous snakes. The Hebrew word is seraph, which could also be translated as fiery serpents or winged serpents. Whatever they are, I don’t think it’s a good thing, particularly when they are surrounding you and biting you. The serpents bite the people and many of the people die. So, the people come to Moses, full of remorse for complaining and they beg him to pray to God to make the snakes go away, as if Moses is some sort of divine snake handler. But in a curious, and certainly unexpected, move, God does not take the serpents away. Instead God sends a strange remedy. God tells Moses to make an image of a snake. Moses makes one out of bronze and, following the divine instructions, sets it on a pole. 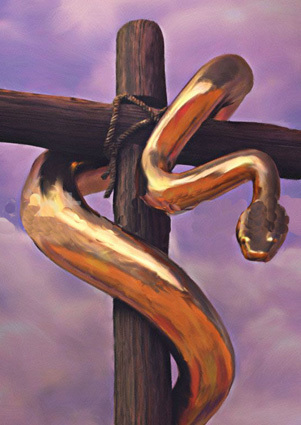 And, just as God told Moses, whenever a serpent would bite someone, that person could look at the bronze serpent and live. Think about it, though. From the very beginning of Creation, the snake has slithered on its belly and eaten only dust without a word of complaint. What better character to rule over the people when they complain about the choice of food? The snake comes to teach humility and patience. Snakes demand our full attention. And in response to the plague of snakes, God gives the people a snake. It is a way of teaching them to look at their fears, to look at themselves, to look at those things that get in the way of life. It is a sight that brings fear and loathing and one that is truly hard to find God’s presence in it. This is a creature that has resigned itself to full surrender. This is very interesting. God sends snakes to combat snakes; God does not destroy the snake as evil; instead God recreates the image of the snake. And centuries later…Jesus’ death is recreated into something that conquers our own and our lives are recreated into something that lasts for eternity. Snakes for snakes, death for death, life for life—it is a paradox. The ancient rabbis equated both the primordial serpent and Satan himself with a force known as the “yetzer ha-ra.” This Hebrew expression is often translated as “the evil urge,” but this translation is dangerously misleading. According to the Jewish understanding, the good Lord implanted into every human being this yetzer ha-ra, a drive that combines features of ambition, greed and desire. There is a myth found in the Talmud that relates how the Jewish sages, shortly after the Babylonian Captivity, were determined to put an end to this threat [of this adversary depicted as the serpent]. Encouraged by their recent success at eradicating the “urge” to worship idols (an urge that had been such a constant stumbling-block to earlier generations, but which no longer held any appreciable attraction to the Jews of their time), –these sages now felt (understandably) that they were “on a roll.” So they decided to seize the opportunity to capture and destroy the “yetzer ha-ra” itself. And they were successful. They caught the beast and bound it in chains, eagerly awaiting the moment when they would remove it from the world for all time. But soon strange reports started arriving: Nobody was showing up at work anymore. No one wanted to marry or raise families. The chickens were not laying eggs! Life had all but stopped. What do you think of the characterization of the snakes as humble and patient? So what is the snake on the pole supposed to do for us? So what does the midrash story mean for you? Do you think there is an “evil” in your life? So what, for you, does this say about the power of God in the world? In one’s life? This is a typical “Reformation” passage. The author starts with a “before”. The three “before” characters are sin, Satan (the “power of the air”), and self. (The power of the air is a Greek reference. The Greeks believed that there was a space between the moon and the earth that was dominated by demonic activity. It’s just a way of thinking through the theology within their own understanding. Verse 4 begins the “after “ position. “But God who is rich in mercy…” The before, semi-dead state was never the way that we were supposed to be. We were made for greater things. God brings transformation through Christ. The emphasis here is the shift from “before” to “after”; in other words, transformation. The agent of the change is God. We are playing a part in the change. This Scripture is a central tenet of the Christian faith. The writer emphasizes that we are saved by faith. But it is not an empty do-nothing faith. Good works, rather than being frantic acts to achieve a heavenly residence, are not transformed into the way we are supposed to live. They become the expressions of God in the world. BUT the writer of this letter (who is more than likely not the Apostle Paul but rather a later follower or disciple of Paul’s) seems to be really focused on continuing this separation between this world and God, between the “sinful” world and God’s promise of grace and life. Paul had introduced the notion of being justified by grace through faith, the notion that God was a redemptive God, that it was a process by which we traversed the experience of this world and along the way encountered God. BUT, here, that word “saved” appears, as if it’s past tense, as if it is some badge of honor that we earn and wear as we continue to be forced to live in this sin-filled world in which we live. Somewhere along the way eschatology became realized, “already”, rather than something to which we look and live into. Now keep in mind that this letter was probably written in the late first century. Jesus had come, died on the cross, and the Resurrection on which everything that is “Christian” is based had happened. And Jesus had promised to return. That had been imminent for Paul. BUT that hadn’t happened yet. The first century Christian followers (it still wasn’t “Christianity”, per se, the way we think of it today) were wondering if perhaps they had misunderstood, perhaps they had gotten the whole thing wrong. So the emphasis for the writer of Ephesians (as well as others), was a notion of echatology that had already happened, an emphasis on the crowned Jesus sitting at the right hand of God. And for those of us who are still mired in the throes of worldly evil and worldly despairs, there became a separation, a dualism that was put into place that pretty much exists even today. So many of us live in this world, burdened by sin, and hope against hope that God will swoop in and save us. Really? Is that it? What happened to “God did not send the Son into the world to condemn the world, BUT in order that the world might be saved through him.“? (But…but…but) God’s vision of the Kingdom of God is not to shun the world or even to rid us of all things worldly. God’s vision of the Kingdom of God is to recreate the world into what it is called to be–BUT the whole world, not the ones who follow the rules or the ones who are “good”, but everyone. So in this life of faith, we do not magically crossover to being “saved” from being “unsaved” and then sit back and wait for God to pluck us out of our miserable existence. Rather, we yield to new meanings and new circumstances as God recreates our lives into Life and brings about the fullness of the Kingdom of God throughout this wonderful created world in which we live. That’s what Lent is about–new meanings and new circumstances. Maybe it’s about dropping the “but” in life. God created the life that each of us has. Why would God call us to leave it behind? Rather God is recreating it as we speak, bringing it into being, into the image that God envisions for it. You know, if we look at things with the eyes of a world where God is not, a world that waits for God to return, there is always a “but”; BUT if we look at all of Creation with the eyes of faith, with the eyes of those who believe in a God who came into our midst to show us how much we are loved, everything has an AND. What meaning does this “before” and “after” hold for you? Does that sound to much like an “event” of conversion, rather than a process? What does being “saved by faith” really mean for you? This Scripture begins at the last part of what is actually a response to a misunderstanding by Nicodemus. Jesus predicts the Passion, drawing on what would have been a familiar passage as an analogy. There are parallels between the two—“look at the serpent and live” and “believe in the Son of Man and live eternally”. There is also the familiar light / darkness language. To love darkness rather than light is disobedience. In this season of Lent, we consider our disobedience, our “dark” living. If, then, believing is the same as obedience, do we really believe? The third verse of this passage, though, is, of course, the “elephant in the room”, so to speak. It’s on street corners and marquis, T-Shirts, football helmets, and sometimes painted on faces at sporting events. It is often taken as the quintessential “insider” verse, the badge of honor for the believing Christian. It is often interpreted as “God came; God came to save me and the rest of you are on your own.” But keep in mind that this Gospel was written later than the others. To be a follower of Christ, a person of The Way, was just downright hard. You were NOT an insider. You were part of a fledgling and sometimes persecuted minority that was just trying to hold it together. So, these words would have been words of encouragement, words of strength, a way of defining who they were as a Jewish minority. It was a way of reminding them why they were walking this difficult (and sometimes dangerous) path—because of the great Love of God. But in the hands of the 21st century Christian majority in our society, they become weapons. They turn into words of exclusion, designating who is “in” and who is “out”. Well, first of all, nowhere in the Gospel are we the ones called to make that determination. And secondly, look at the whole context of this Gospel by the writer known as John. It starts out with Creation. It talks about this great Love that is God. And it proclaims that God came into the world to save the world. So how did we interpret this that God had quit loving some of us? The Truth (that’s with a capital T) reminds us that God offers us Life, that God, in effect, DID come into the world to save us—mostly, I would offer, from ourselves, from our misdirected greed, our disproportionately selfish ambition, and from our basic desires to be something other than the one who God has called us to be. God desires this for everyone. God really does want to save the world from the world. And so the Kingdom of God seems to us to sometimes be inching (or perhaps slithering!) in rather than pervading our world. I think that the world DOES need to somehow be moved to believe, DOES need to somehow begin to see itself anew. But that will never happen if the cross is raised as a weapon. SURELY, we get that it’s something other than that! Remember, God redeemed it. God took something so loathsome, so foreboding, so, for want of a better word, evil and turned it into Life. God is doing the same for the world. God loves the world so incredibly much that God would never leave us to our own devices (or even, thankfully, to those of who count ourselves as well-meaning believers!). Instead, God comes into the world and offers us life; indeed, loves us so much that God offers us recreation, redemption, and renewal. Don’t you think THAT’S the story? It’s not about who’s in or who’s out. It’s about Love. It’s a promise that there’s always more to the story than what we can see or fathom or paint on a sign. To say that we believe does not qualify us for membership; it leads us to The Way of Life. How is this Scripture misused? Does the story that we read from the Old Testament shed (no pun intended!) any new light on the meaning of the Cross for you? The way to Jerusalem is cluttered with bits and pieces of our lives that fly up and cry out, wounding us as we try to keep upon this path that leads to Life. Why didn’t somebody tell us that it would be so hard? In the midst of the clutter, the children laugh and run after stars. Those of us who are wise will follow, for the children will be the first to kneel in Jerusalem. In many theologies the snake is a messenger to the gods. The Greeks, many Native Americans. The Incas had a Serpent Dance led by the Emperor & the Hundred Holy Virgins. The Jewish/Christians are about the only ones with evil. VERY FREUDIAN!